Packing a quad-core 8th-gen Core i7 and a ton of improvements, this is easily the best convertible laptop you can buy today. 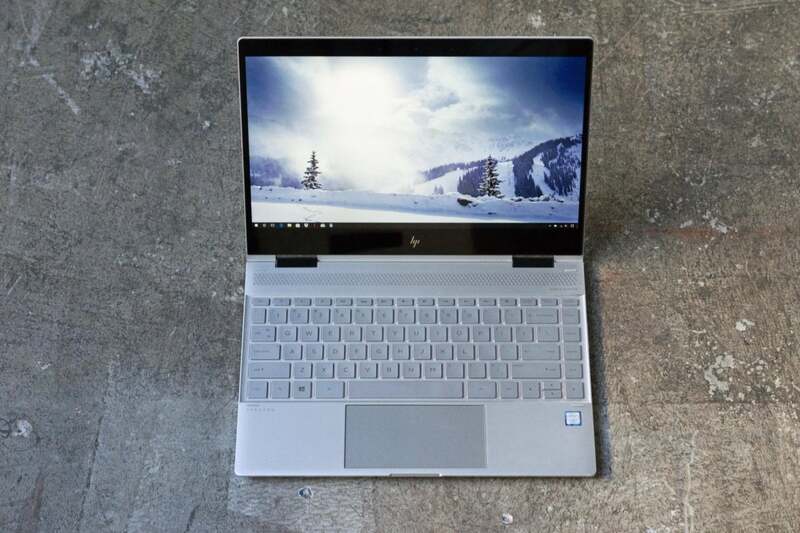 HP’s Spectre x360 proves that HP doesn’t like to sit still. 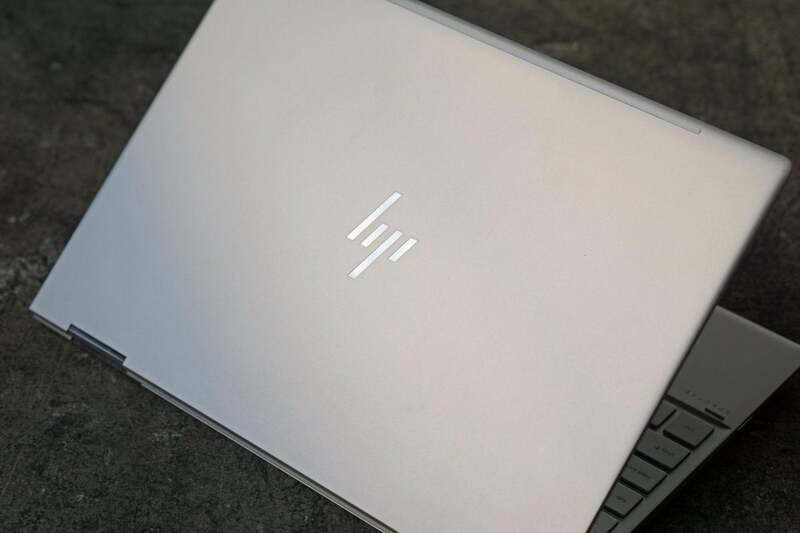 While some companies show up to the dance in the same outfit over and over again (looking at you, MacBook Air 13 and Dell XPS 13), HP has revamped its premium 2-in-1 over and over again—no fewer than three times in the last two years, in fact. In this latest and third version of the Spectre x360 13t, HP didn’t just jam in an 8th-gen quad-core Core i7 and call it an upgrade. It’s also given the entire laptop a significant refresh—one that addresses almost every quibble we’ve had with prior versions. This should give the MacBook Air 13 and the Dell XPS 13 yet another reason to worry. HP wasn’t content to sit still with its excellent Spectre x360 13t. The Spectre x360’s evolution to this point has been complex. 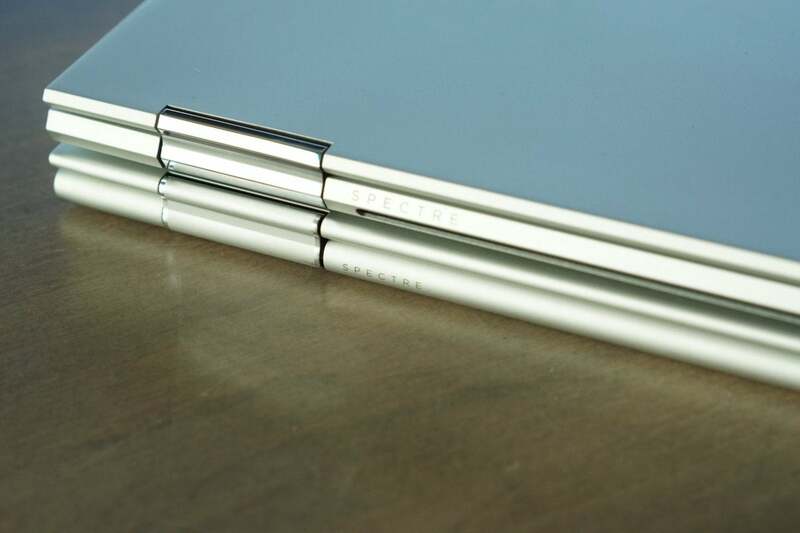 The first iteration of the Spectre x360 was beautifully built from CNC aluminum, but it ran on heavy side. Next to the diminutive XPS 13, it looked giant. HP’s second generation went on a diet. In fact, the Spectre x360 13t was so good, it convinced some of us there was no point in Microsoft’s Surface Pro line anymore. We found that with the Surface and its clones, we used it in tablet mode maybe five percent of the time. For that little-used tablet mode, we give up a lot in lapability. The Spectre x360 13t demanded no such sacrifice. 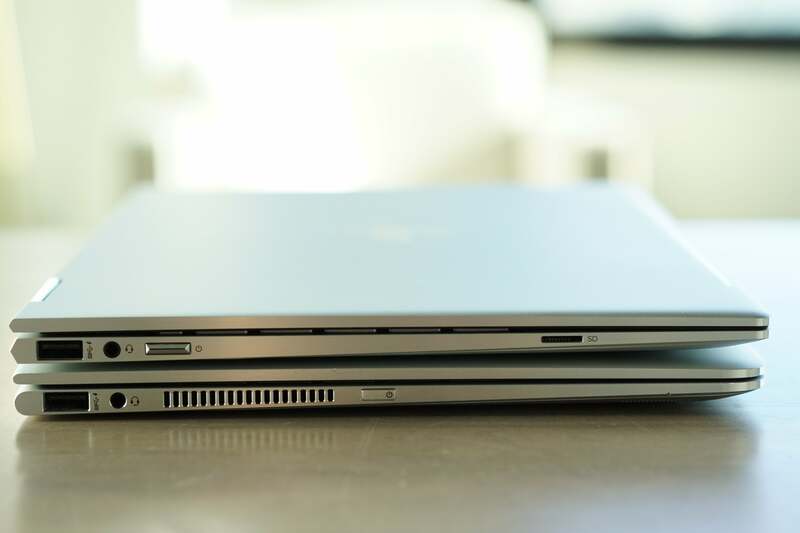 It may look similar, but the third-gen (late 2017) Spectre x360 13T (top) features more squared-off lines compared to the previous generation. The HP Spectre x360 may already be our favorite convertible, but HP has still managed to make it better both inside and out. The original Spectre x360 13t’s face recognition was good, but we always found Microsoft’s Surface Book implementation to be slightly faster. On this new third generation, the Windows Hello support seems to have caught up with the Surface Book’s. For paranoid types who like to cover up the camera, HP now includes a strip fingerprint reader on the side. Don’t worry, this isn’t the old swiper-style reader—it works much better—and it lets you easily unlock the laptop. HP offers many options for the Spectre x360, including screens from 1080p to 4K, and even a privacy screen option. RAM varies from 8GB to 16GB, and the SSD options ranges from 256GB to 1TB. Our particular model features a Core i7-8550U, 8GB of RAM, a 1080P touch/pen panel and a 2565GB SSD for $1,099. That’s an extremely competitive price for the included hardware. Keep reading for a detailed rundown of the configuration and its highlights. The Spectre x360 13t now includes a fingerprint reader on the side. Clever. CPU: Intel 8th-gen quad-core Core i7-8550U. This is Intel’s latest chip technology, which delivers a dramatic boost in performance on multi-threaded work loads. HP also sells a version of the Spectre x360 with the 8th-gen Core i5 CPU, and it doesn’t give up much in performance. To save a bit on cost, consider that one. RAM: 8GB of LPDDR3/2133. While 16GB would be nice, for 90 percent of us, 8GB is fine. Storage: 256GB Samsung PM961 NVMe SSD. In today’s world, 256GB of storage is a little tight—we’d prefer 512GB, or even the 1TB version HP offers. Assuming you don’t load up the Spectre x360 with every picture and video in your world, however, 256GB is plenty. Display: 1920x1080 IPS touchscreen with active pen support. We were generally pleased with the IPS touch screen and its Corning Gorilla glass layer. On battery, however, we noticed that the brightness dropped to about 255 nits max, whereas on AC it was able to hit 295 nits. Pen: Our review unit came with the N-trig based HP Tilt Pen. It has two nifty features. First: no more batteries. Like most users, you only find out your pen is dead when you need it the most. And, no, even Radio Shack Battery Club members won’t have a AAAA cell around. The HP Active stylus slides open to reveal a hidden USB-C port to charge it up. The pen also supports a Presentation mode that lets you use it to scroll down and control the cursor, or flip through a PowerPoint by waving the pen in the air. 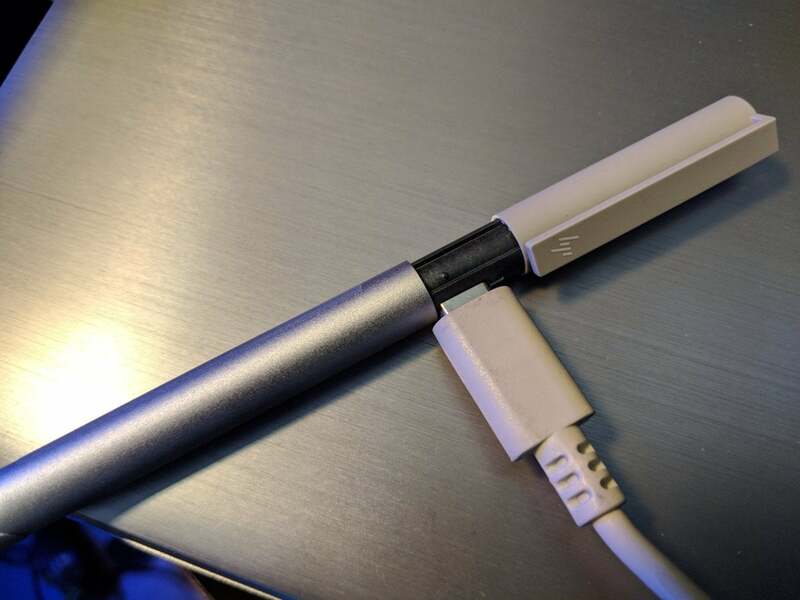 No more hunting for AAAA (yes, quad A) batteries at a Radio Shack: The new HP Active Stylus recharges using a hidden USB-C connector. Keyboard and trackpad: The keyboard and trackpad haven’t changed much from what we can tell. Generally, we like the large keys and long travel. One thing we’ve never gotten used to is the location of the home, page up, page down and end buttons on the far right. Maybe we’re sloppy typers, but we’d hit those keys mistakenly on occasion while typing at full speed. The wide-aspect-ratio trackpad (from Synaptics is also something we’ve had issues with in the past. It’s a good trackpad, but the size meant we’d have to crank up the palm rejection to prevent errant cursor moves. 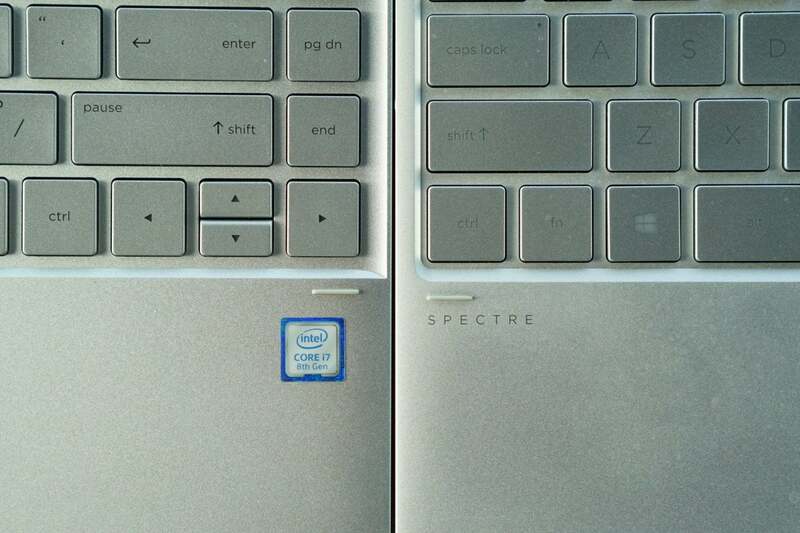 The keyboard tray is resculpted on the new HP Spectre x360 13t (left) vs. the previous generation (right). Ports: New this year is a MicroSD card slot. You get two Thunderbolt 3 ports that both support charging over USB-PD, as well as (thank you!) a USB Type A port. No matter what you think of a PC maker, we should all take a moment to loudly thank any that include at least one Type A port on ultraportable laptops. If you’re wondering whether you can run external graphics over the Thunderbolt 3 ports, you can. HP has actually led the way on supporting external graphics over Thunderbolt 3 ports. In fact, the company even offers a version of the Spectre x360 with an external graphics cabinet. The new HP Spectre x360 13t (top) now includes a MicroSD card port. Dimensions: The latest Spectre x360 13t measures in at 12 x 8.6 x 0.53 inches. Amazingly the weight of the Spectre x360 13t is lighter than before. Our postage scale put the Spectre at 2 pounds, 11.7 ounces. That’s an ounce or so lighter than the previous model. The new model includes a more powerful 65-watt USB-PD/C power brick, which takes the total package up to 3 pounds, 4.7 ounces. The big story with the Spectre x360 13t is the upgrade in performance by moving from a 7th-gen Core i7 to an 8th-gen Core i7. The question with any super-thin convertible, though, is whether it’ll throw performance overboard when things get hot. Our first test was Maxon’s Cinebench R15. It’s a near-pure CPU test that measures how fast a computer can render a 3D image. 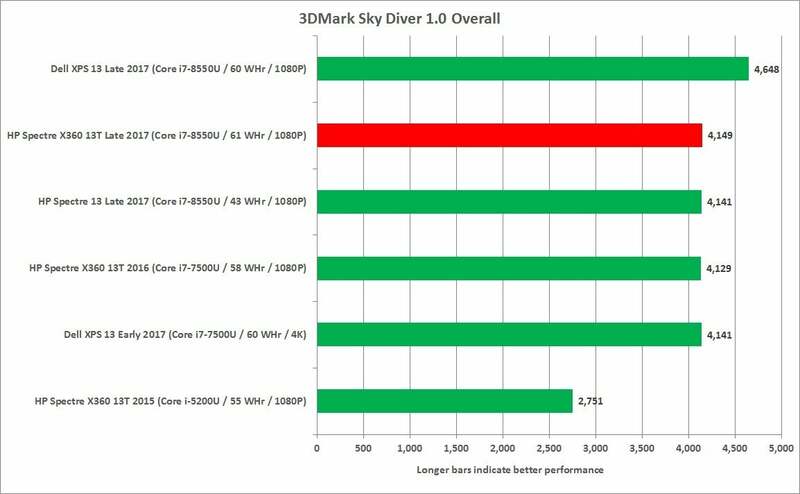 While 3D rendering isn’t what most would ever do on an ultraportable, it is a good way measure performance. We first look at the load spread among all of the CPU cores available. Overall performance is quite good, although the convertible nature and its thinner profile put it behind Dell’s XPS 13. That’s no surprise: Laptops that can be converted to tablets typically must run cooler. 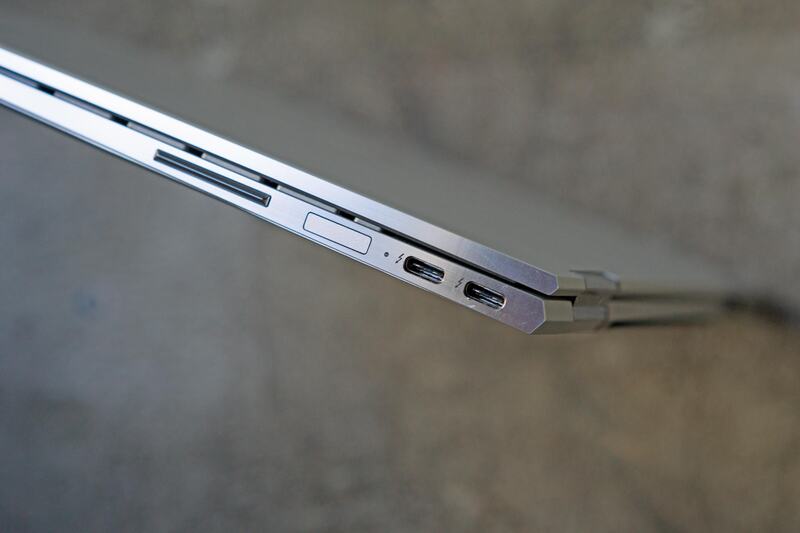 The Spectre x360 13t does ace the even thinner Spectre 13, though. The important comparison is to the earlier 7th-gen Core i7 XPS 13 and Spectre x360 laptops. There we see the 8th-gen laptops prevail in multi-threaded performance. 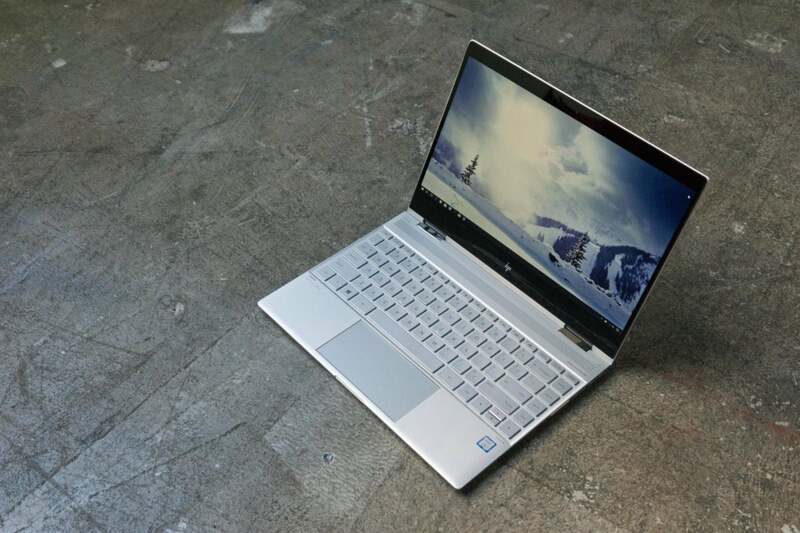 The Spectre x360 13t gives some quarter to its rival, the Dell XPS 13, but that’s to be expected with the laptop-only form factor of the Dell. 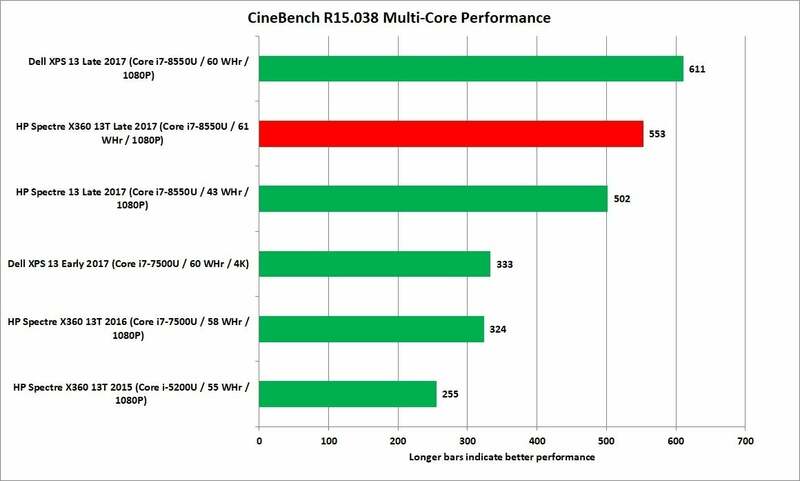 The vast majority of the world doesn’t run on multi-threaded code, though, so for our second text we set Cinebench R15 to render the image using a single core. 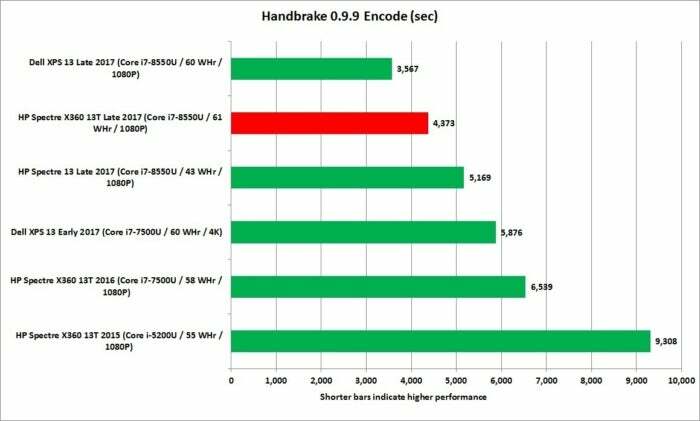 The results put the XPS 13 and the Spectre x360 13t dead even, but the results also tell us that for the most part, you won’t be able to feel much of a difference between a 7th-generation Core i7 and a 8th-gen Core i7 in single-threaded tasks. In most single-threaded applications, you’re unlikely to “feel” the difference between a a 7th-gen Core i7 and an 8th-gen Core i7. Don’t believe us? We also ran PCMark 8 Work Conventional, which, simulates typical office tasks. It reinforces what we saw with Cinebench R15 in single-threaded tasks. For the most part, a typical person doing a typical thing won’t see a difference. 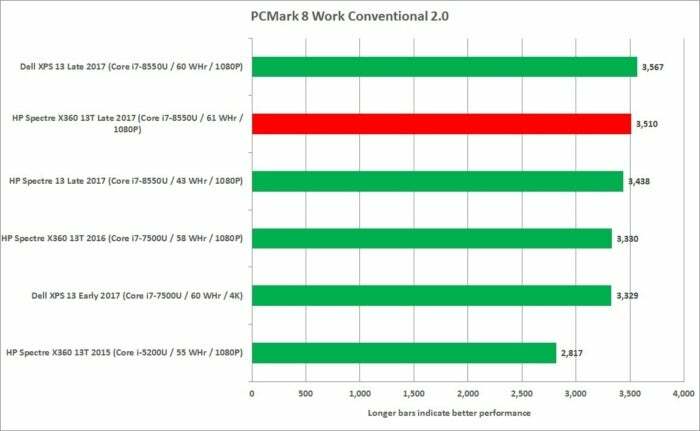 PCMark 8 Work puts most of the Core i7 laptops at the same level because most boring apps won’t exploit all those cores of the 8th gen CPU. Still, there is an argument for more cores if you do things that need it. Our last CPU test uses Handbrake 0.9.9 to encode a 30GB 1080P MKV file using the default Android Tablet preset. 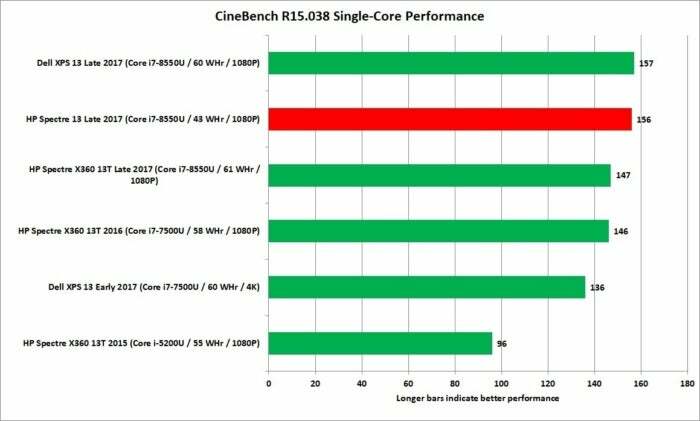 This test favors more cores, and we see the Spectre x360 13t leave its predecessor miles behind. Basically, if you do intend to do heavier tasks such as video editing, encoding and advanced photo editing (using multi-threaded apps), the 8th-gen Spectre x360 13t doesn’t disappoint. If you’re wondering why the Dell XPS 13 is in front, it’s due to the laptop-only design, the thicker body and possibly better cooling. It’s not the Spectre x360 13t’s fault—there is a price to be paid for laptop that converts into a tablet. There’s not much to talk about in graphics, as most of these laptops use the same or very similar graphics chips inside. The laptop-only Dell enjoys a minor lead, but if you want “real” gaming, we recommend you pick up a Thunderbolt 3 graphics cabinet and go to town. It’s pretty much a wash among the Core i7 chips, which all have very similar graphics chips. Our last result is from the most important one to most: battery life. 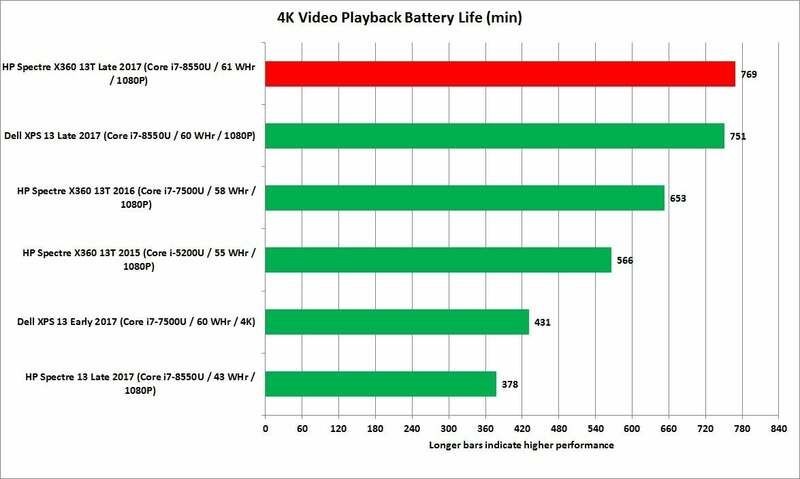 To measure that, we loop a 4K video using Window’s built-in video player (it’s the best one for battery life.) This is done with Airplane mode enabled on the laptop and its display brightness set at about 250 to 260 nits, the brightness you’d need in a typical office or home. We also plug in ear buds with the volume set to a midrange level. The results speak well for the HP Spectre x360 13t, with an excess of 12 hours of video playback. Remember: this is a video run down test. Running intensive tests, using a higher brightness or even browsing means your battery life will vary (more on this topic here.) Still, this is a good showing for the Spectre x360. The Spectre x360 13t comes out on top in our battery run down test by a hair. To think that since its introduction in 2015, HP has introduced no fewer than three major updates to the Spectre x360 13t (including four different CPU choices) while Apple and Dell have done business as usual says something. It’s also easy to see why the Spectre x360 13t has been and will likely continue to be our favorite convertible. It is simply everything we liked about the previous one, with a whole lot more performance.